After racking up over a million and a half miles in freight service for the Nickel Plate Road, no. 624 was donated to the City of Hammond, Indiana for display in 1955. Once referred to by noted railroad author Ron Ziel as "200 tons of junk," the engine languished outdoors for 63 years until the Fort Wayne Railroad Historical Society approached city leaders with a plan to give 624 a new lease on life. Our crews will be evaluating the 624 for either a cosmetic restoration or a complete overhaul to operation. The 624 will be stored off-site at a private facility with rail access until preservation activities are complete. The City of Hammond, Indiana has always been a railroad town. Incorporated in 1884, The City is located on the Indiana/Illinois border, and stretches Southward. Beginning at Lake Michigan, The City of Hammond became the quickest way for railroads to enter Illinois and Chicago from the East. No less than 12 railroads crossed through the City. This resulted in the downtown area being covered in a perpetual haze of smoke and soot, belched from the constant movement of steam locomotives passing through. The New York, Chicago & St. Louis Railroad (Henceforth the “Nickel Plate Road”) was one of them. By 1953 the Dieselization and replacement of steam locomotives on the Nation’s railroads was in full swing. It was becoming apparent that within a few years the “Iron Horse” would be a memory. It was at that time that a local group was formed to try and secure a steam locomotive for permanent display in Hammond to honor the steam era of railroading. With the blessing of the City of Hammond, Indiana, The Calumet Railroad Community Committee was formed. This group was a local arm of Eastern Railroad Presidents meant to foster goodwill and cooperation between railroads and the communities they passed through. The Group was headed by Clark K. Strader. On January 4, 1955, the Group sent an open letter in the Hammond Times newspaper requesting that a steam locomotive be donated to the City of Hammond for display and posterity. Around the same time there was a nationwide drop in business on the Nation’s railroads, resulting in the temporary storage and sale of excess locomotives. Nickel Plate Road Mikado 624 was one of them. The President of the Nickel Plate Road responded with an offer to donate a locomotive to Hammond. There was no stipulation as to what kind of locomotive Hammond wanted, so the Nickel Plate went shopping with a free hand. Out of all the available locomotives, engine 624 was chosen. 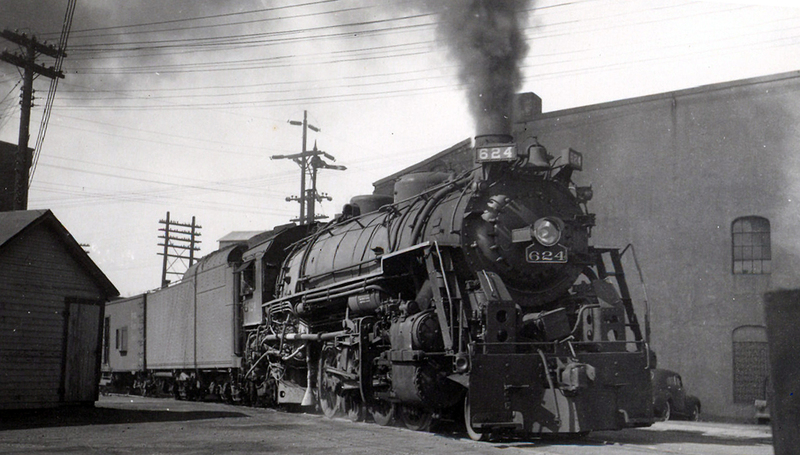 The 624 was recently retired in August, 1955. The locomotive spent the last 33 years accumulating 1,698,000 miles in various functions for the Nickel Plate over the years. One of the last duties performed by the 624 before retirement was performing online switching in the Indiana area. Delivered as part of order #1033 and delivered to the Nickel Plate in November, 1922, the 624 was part of an order of 15 Mikado type 2-8-2 locomotives designated Class H-6d. The Nickel Plate had ordered three sets of 2-8-2 locomotives from the Lima Locomotive Works in Lima, Ohio before this order. As the previous locomotives went through their paces, the Nickel Plate took note of their operation and performance. Each subsequent order was therefore refined with the knowledge gained from the previous order. The Nickel Plate Road heavily modified all their Mikados, and when the 624 was retired She had been retrofitted with flying number boards, a heavy steel pilot, redesigned running board on the engineers’ side, and Thermic Syphons. The syphons increased horsepower slightly, but their main function was to enhance the water circulation in the firebox, gaining better heating quality and increasing flow through the Mud Ring, where water usually was trapped. The 624 was pulled from storage and sent to the shop area. She received a fresh coat of paint, new lettering, and the firebox along with the fireman’s storage door on the tender were welded shut. Arrangements were made with the Erie Railroad for delivery. The Erie had a yard just West of the location where 624 was to be placed. The railroad donated the land where the 624 was to be displayed to the City of Hammond. A spur was constructed, track laid, and a concrete base was poured where the locomotive would be enshrined. September 13, 1955 was Dedication Day. Newspaper and Television Stations arrived to cover the Dedication, along with all the dignitaries invited to witness the event. 624 sat on the newly constructed spur with a banner placed on her side which read “Presented by Calumet Railroad Community Committee”. A ribbon was placed between an opening in the new fence where the 624 would roll through to its permanent display pad. When the signal was given, an Erie Railroad Alco S-2 pushed the 624 though the ribbon and placed her on the display pad. Everything went well. The 624 arrived with cheering and clapping from the assembled dignitaries and media. Some accounts of the dedication stated that there were also fireworks set off. The gathering was informed that a dedication marker was to be made a commemoration ceremony would be announced when it was completed. The event turned out to be a very big story, both locally and regionally. It was so big, in fact, that a problem arose. Some of the media outlets wanting to cover the event arrived late to the ceremony. A decision was made to back the 624 out and place her back a second time for the late arrivals. So, the 624 was dedicated twice that day. Children rode their bicycles to the display and fathers took their children to see “Old 624”. The sign on the side of 624 was not even removed yet, and the paper was torn and tattered as the children climbed into the cab and crawled up onto the pilot. Free access to the 624 would soon bode bad tidings for the locomotive. The first substantial vandalism happened in May, 1956, only 8 months since dedication day. The trust plate, superheater and builders’ plates had all been removed by souvenir hunters. The glass in the flying number boards, the original number boards next to the headlight, and the headlight and mars light lenses were all broken by rock throwers. It is unknown what damage, if any, was done inside the cab. Knowing that the dedication ceremony for the stone marker was upcoming, the City scrambled to make 624 presentable. Clark Strader, the head of the Committee that presented the locomotive to the City a year ago, told the Hammond Times Newspaper prior to the marker dedication that “it (the 624) has undergone extensive renovation to restore it to its original beauty”. The marker dedication was performed on September 19, 1957. The unveiling was attended by many of the participants from a year ago, including superintendents from local railroads and dignitaries from the City of Hammond. The stone marker sat on a concrete slab with a cover over it. The President of the Hammond Park Board, and Hammond Mayor Edward C. Dowling removed the cover to expose the stone marker which read “This locomotive presented to the City of Hammond by the Calumet District Railroad Community Committee commemorating the steam locomotive era in railroading. Acceptance by Mayor C. Anderson. This Memorial dedication by Mayor Edward C. Dowling Sept. 19, 1956”. After the initial celebration, 624 sat silent as the years past. On occasion, the City opened the display to visitors who were assisted by a guide who answered questions and watched as the guests filed through the cab. The harsh Northwest Indiana winters and rainy summers took their toll on 624. By 1971 it started to show. Donald Wilson was a local railfan who took notice of the 624’s steady decline. He assembled a group of 12 individuals consisting of family members and volunteers to take on the task of refurbishing the display. The group had the blessing of the City of Hammond and set out to work. They removed the boiler jacket, performed asbestos abatement, and completely painted both the 624 and her 22RA tender. Removal of the boiler jacket was the most important act that the Group performed. It stopped the rust from eating away at the locomotive, essentially saving it from rusting away. The heroic contributions of Don Wilson and his crew could not stop the continuous vandalism to 624. The locomotive endured constant damage, paint was spilled on the tender, the inside was also tagged with graffiti. The marker lights were stolen, the brass from the journal boxes removed, and the number board was also taken. All the gauges and appliances in the cab that were not secured were stolen. Fearing the bell would soon be the next target, it was removed and stored inside the Hammond Civic Center, which was across the street from the display. Despite all the continuous vandalism and theft, the display was expanded on June 12, 1976 to include a Milwaukee Road Reefer and South Shore Railroad caboose #1062. A Watchman’s Shanty was also added. The pad that 624 sat on was expanded, with new track being laid, and the 624 was pulled forward to accommodate the new cars. Soon after, someone set fire to the caboose, burning off the roof. Transients took refuge in the reefer, only being discovered and evicted when they sat and watched a Hammond High School football game from the reefer door on a nice evening. The Northwest Indiana Railroad Preservation Society (called NWIRPS, and later NIRPS) was formed in 2007 by a group of local individuals. Its goal was to try to preserve artifacts from local railroading, and to look after the 624 display. NWIRPS washed down the 624 and cleared debris from the pad it sat on. The mars light and headlight were removed to be reconditioned. The tender and cab numbers were repainted in the correct gold lettering used by the NKP. Never having enough money to operate with, and with the failed attempt to move Hohman Tower, NWIRPS slowly disappeared. Members walked away in disgust. Monthly meetings could not be held because of a lack of a quorum. The Fort Wayne Railroad Historical Society’s offer and acceptance by the City of Hammond, Indiana to move and restore the 624 is singularly the best thing that could happen. Finally, the 624 will be given all the care it sorely needed for so many years. Clark K. Strader and Donald T. Wilson (1931-2010) are the heroes here. Without them there would be no locomotive to restore. The Nickel Plate Road Technical and Historical Society did an article on the 624 a few years back asking the question “Will She be a Survivor?”. At the time, there was a very serious doubt that the locomotive would, indeed, still be around. We now know the answer to that question. The Fort Wayne Railroad Historical Society extends its thanks to the City of Hammond, Mayor Thomas McDermott, Jr., Mark Heintz, Hammond Parks and Recreation and the Hammond Board of Commissioners. In addition, we thank for their endorsement letters and support our numerous partners in the railroad preservation community including Jim Wrinn, TRAINS Magazine; Robert McGonigal, Classic Trains Magazine; John Slater and David Vaughn with the Nickel Plate Road Historical & Technical Society, Inc.; Dwayne Fuehring and the Mad River & Nickel Plate Railroad Museum; Les Beckman and Mark Knebel of the Hoosier Valley Railroad Museum, Bryan Lalevee, Indiana Harbor Belt employee; Robert Conway and Tim Pitzen, Metra employees; Ray Breyer, Nickel Plate historian; Ray Kammer Jr. and Ray Kammer Sr., former Hammond residents; Peter Miksich, Hammond resident; and Kevin Heggi, Munster resident and founding NIRPS member.